The Panchadashi Yantra is a most powerful numerical Yantra, which apart from the purpose described here, is also prepared for a wide range of purposes like making money, wealth and getting peace of mind. The Vashikaran Experiment described in this post can be used to cast an Occult Spell over any person for the purpose of love, marriage, business or getting favors from any powerful person. The Panchadashi Yantra Vashikaran Prayog should be performed on a Monday morning, after bathing and wearing fresh and clean clothes. The practitioner should take the 4 ingredients mentioned below in small quantities and grind then to prepare the ink for drawing the Panchadashi Attraction Yantra, which is shown in the image. An Anar Kalam [pomegranate twig] should be used as the pen. The Yantra should be drawn on a Bhojpatra and then sincerely worshiped, an incense stick and an oil lamp should be lit in-front of it. Then, the practitioner should chant the Panchadashi Yantra Energizing Mantra, which is shown below the image of the Panchadashi Yantra 108 times, using a Rudraksha Japa Mala. Then, the Panchadashi Yantra for Vashikaran should be folded and placed inside a Gold Locket and worn around the neck as an attraction charm. 1:Can you also post other uses of this Panchadashi yantra in future post ? 2:can atma raksha mantra protect againts this kind vashikaran influence ?? Thank U dear Guruji !!! Yes, atma-raksha mantras can protect against all kinds of spells, including Vashikaran. My question is not related to this post, but some earlier post. In one of the post you have mentioned flowing water, since there is no canal or river nearby where i stay. I will be going to Mumbai in a month or so. Would you consider sea water as flowing water? So that I can finish my upay. Thanks in advance. The see is a flowing water body, you can immerse your articles in the sea. only gold locket to be used or cloth locket or any other also ok.
And how many days puja to be done and where name of persone to be write and how many dsys to ware and and after how manys vashikarn will hapen and is it can use for women vashikaran. Gold Locket is the prescribed locket for this Yantra. The rest of the procedure in clearly described in the article. 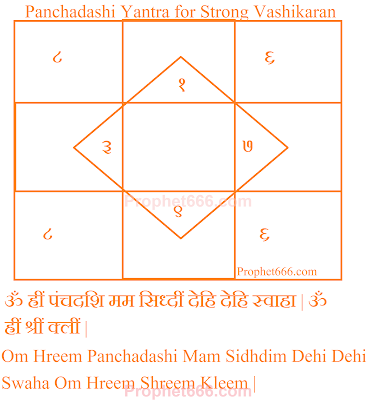 Great article about the panchadasi yantra for strong vashikaran. Thanks for sharing it. Here I would like to share more information about the analysis of "Panchadasi Mantra". कपिला गाय भूरे बादामी रंग की होती है.ग्रामीण क्षेत्रों मे इसका दूध मिलने मे कठिनाई नही हैं नगरीय क्षेत्रों मे भी ,जहाँ ग्वाले दूध घरों मे पहुँचाते हैं,उनसे इसे प्राप्त किया जा सकता है.